Fula Flute returns to the source while continuing to innovate with Bailo's vocals and performance by Sylvain on the chromatic tambin, his patented invention that, as opposed to the traditional tambin which is limited to only one tonality, can play in all keys. Field recordings by a class of Guinean children, the result of a four-month pilot project to teach music literacy through the medium of the chromatic tambin—a variant of the Fula flute that can play a complete Western chromatic scale. Sylvain Leroux debut CD. Features an acoustic, world jazz combo of master musicians with legendary Karl Berger on vibes and piano, Haitian percussionist Sergo Decius and bassist Matt Pavolka. This record looks to the Creole roots of jazz; the nexus where Western Classical and African music joined to create the music we know as jazz. Featuring Master Bailo Bah, this is the CD that started the revolution. 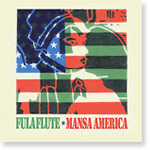 Released in 2002, Fula Flute has acquired cult status and strongly contributed to the worldwide awareness of that astonishing flute. Many of these tracks have been used in movies, TV shows, dance theater, and are a daily fare on the national airwaves of Guinea. Released during the 2008 presidential election and entirely dedicated to President Obama the album had a YouTube hit with the track "Obama" which was hailed by Radio-Canada as the most beautiful of all the Obama tribute songs. Released in 2006 and featuring star Malian singer Abdoulaye "Djoss" Diabate. Source is an African-Jazz group that has been on the New York scene for more than ten years. Afopop journalist Banning Eyre writes: "... a splendid group whose sound and spirit capture a unique moment of African emergence and synthesis in New York City." Traditional music release by the great master of Mande jaliya in the United States, Abdoulaye Djoss Diabate. It features performances by the cream of the New York City West African music scene and Djoss' exquitsite, original vocals.